Chairman, Ian Payne, welcomed 27 members and our speaker, Glenda Law, to our September meeting with a particular welcome to returning members Roger Davis and Hugh Roberts. 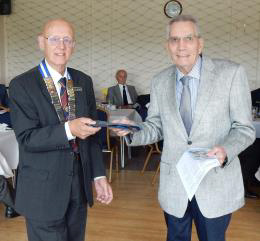 Our latest member, Trevor Peck, was inducted with presentation of tie and constitution. Our almoner, Andrew Kellard, reported on the frailty of Tony Simpson and Arthur Truncheon, although arthur is still making his wooden models for charity. Andrew also reported that Eugene Lighbody was in hospital but we have since heard the very sad news that Eugene passed away on 12th September. He was a member for twenty years and a keen golfer playing with other Probus members. The funeral will be on Friday 12th October at 1 pm at Croydon Crematorium, West Chapel. The reception venue is not yet decided. Please contact our almoner, Andrew Kellard on 01737 554055, if you, your partner or another member is unwell (also temporarily for lunches – please notify Andrew by 10.30 am the prior Tuesday). Andrew informed us that there were three AWLs last month. The Charity Collection raised £51 and the raffle £23.80. The Chairman is trying to arrange a display of our boards (from the gazebo at the Old Coulsdon Fair) in Coulsdon Library. He also highlghted his article on ‘cookies’ in the Newsletter – we’re all nonplussed at the constant requests of every website to accept their cookies. Secretary, Dennis Evans, highlighted an article in the autumn Probus Magazine – page 24: ‘A year ofcelebration’ for Coulsdon Probus’ fiftieth anniversary. Also of interest onpage 32 are letters on ‘How our club recruits’ (Tewkesbury) and ‘GDPR’. Speaker Secretary, Andrew Banfield asked if any member wished to volunteer but also, are there any subjects members would like to hear about? Membership Secretary, Reg Baker issued an addendum slip. Where are the Seychelles? They are in the middle of the Indian Ocean, 1000 miles from Africa, 1000 miles from India and 500 miles from Madagascar. They are different from anywhere else – the only oceanic granitic island in the world. Glenda took us back 180 million years to explain that the Seychelles are a mini-continent left over from when the supercontinent Gondwanaland broke up. The main island is Mahé – it has a ‘Little Ben’ clock in the main street ofthe capital, Victoria. The Seychelles have belonged to UK, France, UK, France, so, being diplomatic, there are two flagpoles at the harbour – they raise the appropriate flag for each visiting ship. Bus transport hasn’tchanged since the 1960s – hold tight as they take you over the mountains with vertical rock faces and sharp bends. Taking live coral is banned. Glenda showed us her pictures of the birds on Mahé: grey heron, cattle egret, Indian common minor bird – it doesn’t talk, it screams – an aggressive nester and the Madagascar turtle dove. The cost of living is exorbitant – the poor catch the fish and sell at the roadside to rich tourists.Plants include the giant milk weed, poison lily and the country’s emblem,the Seychelles Lily. The giant land snail (introduced from Madagascar) is 2″ to 3″ long, an American cockroach (came in with luggage?) is 2″ long and the palm spider (totally harmless) is the size of a chaffinch. There is avenomous spider but it’s a quarter the size. There are masses of species ofgeckos, frogs, toads, and legless amphibians. The Seychelles skink (something between a lizard and a snake) is 31⁄2″ long but has very short legs. There is a fruit bat with a 3′ wing span, but there are no land mammals. The fody bird is the size of a chaffinch – the male is red but only in the breeding season. Pitcher plants on the mountains lure insects with their sweet liquid and then digest them as they drown. The Seychelles stick insect is 4″ long but the male is smaller. And we have to mention the Mahé, so called, stripeless green day gecko which has a red stripe! Glenda next took us to other islands of the group. On Bird Island they have to chase the birds and tortoises from the runway. There are many species of birds here but no ground breeding ones because of the rats. La Digue Island is the favourite venue for weddings – only horse-drawn vehicles allowed (except for building vehicles which are used as transport!). Praslin Island is a world heritage site – red-footed crabs, mudskippers and coco da mère (giant coconuts) named for having been found in the sea off India before their true source was discovered, and more geckos, parrots and frogs (found back in Glenda’s hotelroom). Cousin Island is a nature reserve managed by BirdLife International. Frégate Island has more of everything – turtle doves, giant millipedes, giant tenebrionid beetle, blue pigeon, magpie robin and another green day gecko, but this one (not called stripeless) nonetheless has no stripe! Luncheons Secretary: Andrew Kellard continues to soldier on, but this is quite unfair on him. Outings Secretary: To co-ordinate (with other members’ support) nextyear’s outings. This year we have been busy with our 50th Anniversary. Committee jobs are for, say, two years. So why not give it a go – please. Celebration Lunch: 17th October 2018: The Chateau, Coombe Lane, Croydon. Booking forms were released at our August meeting and at the time of writing we have fifty-two members and guests for our celebration. (note the venue). Dennis Evans will be quizmaster as usual and there will be a fish and chip supper (£12 p.p.). Booking/menu forms were released at our September meeting and entry forms have been arriving including from other Probus Clubs. There’s still plenty of time to book your table – or come as acouple or on your own and we’ll join you up. Members agreed that any surplus from the event will be donated to the Chairman’s charity –Coulsdon Centre for the Retired (Old Coulsdon) – thank you. We voted for Brexit though at the time we had no idea what we were voting for. One side was promising riches and the other misery. Then we had an inconclusive general election. Now, day after day, we hear the politicians and the pundits and the EU slug it out with no end in sight. Will it be a ‘no deal’ Brexit or will there be an agreement with theEU, although it can be said with certainty that there will be many who think that we voters have been betrayed whatever the outcome. And now there is argument about whether we should get another vote. Will it be yet another general election or another referendum? If the latter, whatwill be the question? Do we accept the ‘deal’, do we accept a ‘no deal’ and will there be a choice of ‘Remain’. Will it be a ‘single transferable vote’ or ‘first past the post’? And what’s it really all about – not us, but whether both main political parties can keep themselves together. This month I’ve been looking at 19th century polling records as part of my family research. I’ve come across some Huntingdonshire (now partof Cambridgeshire) records of 1826. ‘A Poll for Two Knights of the Shire for the County of Huntingdon’. Candidates William Henry Fellowes, Esq … 911 votes, Lord John Russell … 858 votes, Lord Mandeville … 968 votes. ‘Knight of the shire’ was the formal title for a member of parliament representing a county constituency in the House of Commons. The Redistribution of Seats Act 1885 ended the practice of each county forming a single constituency. Note that Lords could stand, voting was restricted to ‘freeholders’ and to men only, aged 21 and over. Before 1832 the basic qualification for the vote in county elections was ownership of freehold land worth 40 shillings (£2) a year, not changed since 1429. From 1763 the holders of annuities or rentcharges on freehold land (Pauline’s great great great grandfather inSouthoe, Huntingdonshire) were also entitled to vote. There was no secret ballot. The results were all published – Robert Bard voted for Fellowes and Mandeville (as did his landlord who was also his employer!). 18th September 2018 saw the 100th anniversary of the ‘Representationof the Peoples Act’ which gave the right to vote to women over 30. [Ittook until 1928 for this to be extended to age 21.] The Suffragettes took 86 years to win their battle. There are many museums and exhibitions celebrating this theme as well as books, theatre, statues, coins, stamps – you can even join a procession. But the fight for women’s equality goeson for equal pay, parenting, education, healthcare, media and an end to violence against women. Voting districts and boundaries are forever in flux. For the local elections in May this year, the wards of West and East Coulsdon were re-distributed. We now have Coulsdon Town and Old Coulsdon. Coulsdon Town has three councilors and has poached the roads between the railway and Farthing Downs. Old Coulsdon has two councilors and includes Coulsdon Woods Estate and Coulsdon Manor. Does this allow those residents north of Stoneyfield Road to adopt the one-upmanship of putting (the unnecessary) ‘Old’ as part of one’s postal address?Residents’ Associations are sticking to the old names and are jealously guarding their borders. Plus ça change, plus c’est la même chose.